Beginning in the early 1990s, the West Virginia Department of Transportation recognized the need for an access corridor from I-79 to downtown Fairmont, in need of economic revitalization. The challenge was how to incorporate elements that would enhance the way of life for all users, including pedestrians and bicyclists, while also causing minimal disruption to the area's citizens. State and local officials knew they had an opportunity to construct something unique for the community, which is located 140 miles northeast of Charleston, West Virginia. 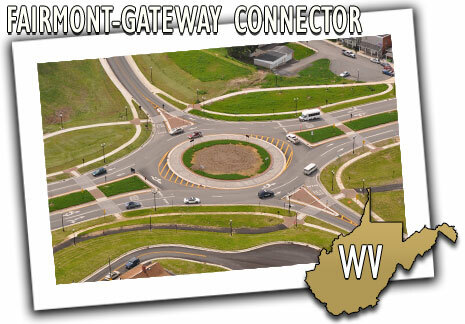 They came up with a "context sensitive solution" design to create the 1.5 mile, 4-lane Fairmont-Gateway Connector, which integrated the project into the surrounding neighborhoods and included bridges, a new county welcome center, a recreational park with walking and biking trails, two modern roundabouts, and substantial landscaping. "Utilizing a 'context sensitive solution' design integrates the project into the surrounding neighborhoods and incorporates many amenities not typical of highway construction," said WVDOT Secretary Paul Mattox in a statement. "These include bus shelters, designated bike paths, walking paths, paver and granite crosswalks, landscaping, and lighting, all of which give the connector a park-like setting." The Fairmont-Gateway Connector opened to traffic in December of 2010. Now dubbed the "front door" to Fairmont by the community, the Fairmont-Gateway Connector has rejuvenated the economy. Almost immediately, new business opportunities were seized, showing just how important this link is to the economic development of the area.